Whatever we design life will verify it at the end… but I would rather know if my design has a fighting chance before any major collapse occurs! This is why FEA results verification is a very important thing. When you are solving a known problem (i.e. as a benchmark) this is easy to do. You just compare the outcome of your calculations with the correct known results… and that is all (or you have some tweaking to do, which is more likely!). But usually, you won’t know the correct answer right? This is when things become a bit tricky. And if you are anything like me you may be in trouble! You see, I have a tendency to find “weird” justifications to unexpected outcomes I get from the analysis. I’m so good at it that I even managed to convince myself once or twice that something was ok… until further analysis showed that it was not! I think a lot of people simply want to “succeed” in what they do. This means that if something unexpected happens, we tent to search for a justification of the fact. This is a great mental exercise for sure, but I’ve learned long ago to actually verify the outcomes I receive. Below is a small process I try to follow in doing so! I think that shape of the deformation is more important than its value! 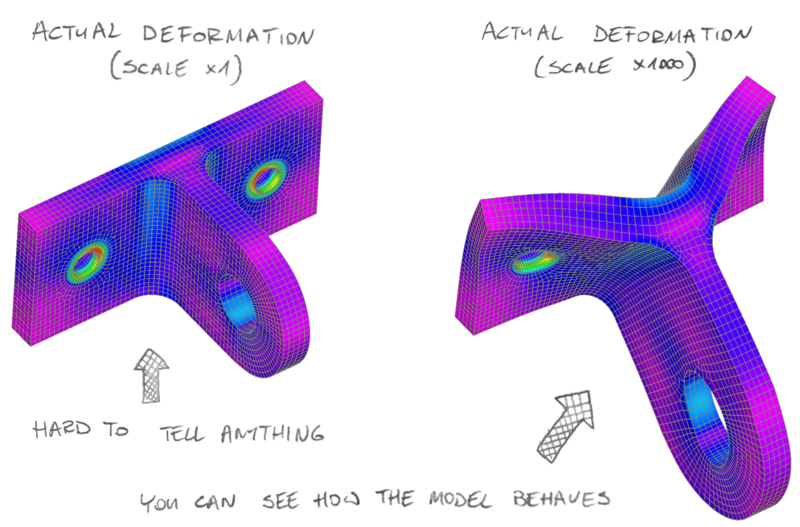 Checking how the shape of the deformation looks like gives you a chance to think whether the model works as intended! This is not a code-check or a demand your Customer will have. This step is only for you, as it allows you to see if everything went well. Note that you may need to increase the scale of deformations dramatically to see the model behavior. Again: this is not about the value of the deformation, but about the shape of it! Checking deformation values may be a bit tricky. This is because the software usually “auto-scales” deformations based on the model size. This means that what you see on a screen is not the “actual” deformed shape, but rather shape with scale factor selected by the software automatically (to “enhance” user experience). I admit this is usually a nice feature, but it can be greatly misleading. Be sure to set the deformation scale to 1.0 and vied the deformed model there as well. Bear in mind that too big deformations aren’t the only issue here. If you know that the model should deform, but it didn’t something is wrong just as well! If you modeled a flower pot standing on the ground, you may have omitted contact definition and model a vertical support on the entire bottom surface of the book. 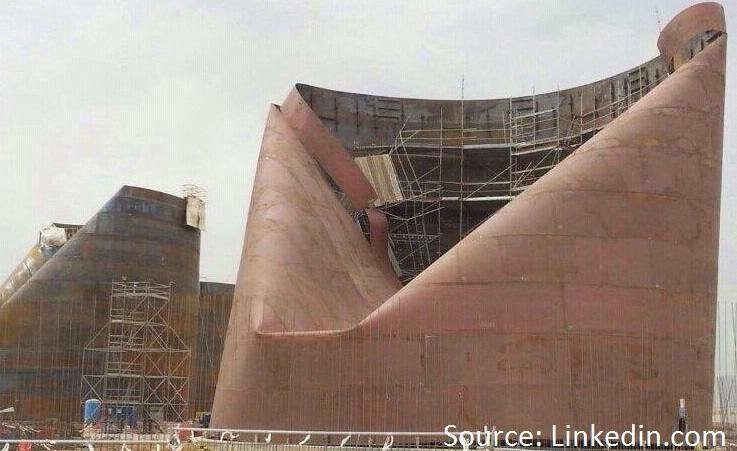 This is great… unless you get a tensile force in that support! Such load could not appear there (unless the pot is glued to the ground of course). With this in mind, if you would get a tensile reaction force in that support you know that the assumption you have made (to ignore contact) doesn’t hold! This is a very common mistake, that can lead to big mistakes in boundary conditions – more on this in one of the lessons of my free FEA essentials course. From time to time, you will analyze a problems that are “a bit” unstable. You will most likely stabilize it with a very soft spring (sometimes called an “air hook”). This is a completely fake support but it helps with numerical calculation of the problem. When you finish the analysis it is a very good idea to check reaction forces in those soft springs… Since there is no real support there, the reaction force should be minimal! If that is not the case… you need to rethink softness of the spring or a place where you have added it. If you have changed the placement of soft springs several times, and you still get huge forces in air hooks, maybe your model is so unstable that it simply won’t work? If you have doubts about what boundary conditions to use, use both sets and compare outcomes. This way you will see if the assumption you are uncertain about will play any significant role in design. Also, thanks to the fact that you can take a look at a deformed model in both cases, you may be able to decide which solution is more realistic. I usually do this while checking if stresses are acceptable. But the goal here is not to assess if the part you have calculated is good or need strengthening. We are checking if the outcomes we get make any sense at all! By default, your software will most likely show you the average stress. This may not be the perfect approach. Just find the place where averaging is being used, and turn it off. You will be surprised how much the outcomes may change! If the differences in stresses are big for adjacent elements, you should consider refining mesh in that region! Usually, there are several options on how outcomes are displayed in your software. Learn about them and use them wisely! 5. Do the hand calculations! This always gets me at least few weird looks but I feel that verification of FEA outcomes with simplified calculations is a freaking super-power! This post is getting long, and hand calculations really deserve a post in FEA results verification. You may be sure I will get back to this on the blog! Want to learn about FEA? This is GREAT! I’ve just finished a free FEA essentials course. I’m very glad that you like it! I’m really glad that you like this! Got some useful stuffs. Thanks for the nice share and your efforts. I’m very happy that you like it! Very good! Go on with such intresting articles! I shocked with your honesty when you wrote “… find “weird” justifications to unexpected outcomes I get from the analysis. I’m so good at it that I even managed…”. I’m usually involved on civil calculations easier than subjects that you explain and sometimes I find myself on the same point and it scares me! Lucky me that I also revise twice. Great blog! I can’t stop reading! Thanks for sharing your knowledge! all the best, and thanks for writing!